…I think I am sharing the wealth. Within a two mile radius of my home are a plethora of drugstores, grocery stores, convenience stores and liquor stores that can meet my need for one half-pint of Skyy vodka. Always just one. Each intended to be the last. Occasionally a location I visit is plum out of half pints. I silently curse my neighbors for impinging upon my supply. Friday morning I visit a local Walgreens. The young liquor department manager brushes his long black bangs out of his eyes and looks up at me excitedly. Come, he motions. There is something he wants to show me. The shelf below the various brands of half-pints has been reorganized. 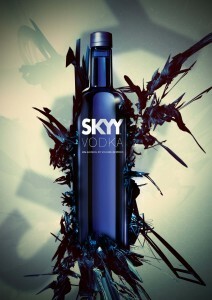 Now it contains nothing but distinctively dark blue bottles of Skyy vodka. “I’ll never run out on you again,” he beams. Vaguely I am aware that I am making multiple purchases a day. But am I really the cause of the short supply I have noted? I share the wealth after all. Have I really impacted how a liquor department manager makes his shelving decisions? I’m crestfallen. In my mind I am the most pleasant, well-adjusted customer they ever see. Surely I am no problem drinker. The newly stocked shelf says otherwise. Accepting you have a problem is half the battle. But acceptance doesn’t come easily to someone as stubbornly self-centered as I am.